Villa Oceano Azul at 1400 South Ocean Boulevard, Manalapan, Florida, one of the most prestigious homes in South Florida, has been newly priced! Please join us for a “virtual tour” of this spectacular ocean-to-Intracoastal mansion. 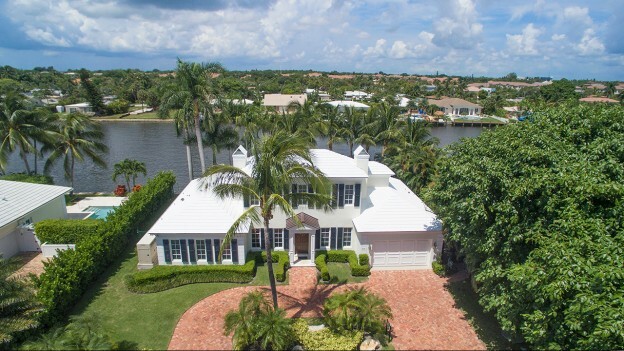 Manalapan, Florida is a highly-exclusive enclave situated directly to the east of Boynton Beach, Florida. Delray Beach and Boca Raton are short distance south and the Palm Beaches are to the north. Manalapan is the embodiment of the fabled “Gold Coast” of Florida—a region known for its affluence and the luxurious lifestyles of its residents, as well as for its incredible scenic beauty. Residents of this prestigious community enjoy deeded club privileges at the Five-Diamond Eau Palm Beach Resort & Spa. Flanked by sparkling waters, the property of 1400 South Ocean Boulevard is remarkably beautiful. This majestic masterpiece is situated on 1.5± acres of coastal land encompassed in tropical greenery, and directly fronts 205± feet of beautiful sandy beachfront. On the other side of the property, just across a quiet, narrow street, Villa Oceano Azul fronts 203± feet of the Intracoastal Waterway on private property. There is an amazing full-service concrete dock as well. The west pool terrace is walled, gated, and serves as both an entrance courtyard and an outdoor entertainment space. Two different gated entries lead to a huge motor court that leads to the main residence, the guesthouse, and garages totaling six bays. There is a remarkable pool terrace on the east side of the home as well. Lush, green lawns slope to sea-walled shoreline with stairs to the sand. Every room on the east side of this marvelous estate opens to the east pool terrace. Villa Oceano Azul at 1400 South Ocean Boulevard features a sweeping, open floor plan, and spans 20,712± square feet of designer finished and furnished living space. Villa Oceano Azul provides seven bedrooms, nine full and four half bathrooms, and a separate guest house. Truly representative of Gold Coast luxury living, no expense was spared in this opulent estate. Villa Oceano Azul features such luxury amenities as two elevators, 11-zone air conditioning, as well as first-floor and second-floor laundry rooms. A breathtaking ocean view immediately greets those who pass through the iron-filigreed glass entry doors to the open, double-height reception room, which features refined moldings and geometric-patterned inlaid marble floors that perfectly blend traditional and modern style. Resting under a coffered ceiling, the oceanfront living room is adorned with an exquisite onyx-encased ribbon fireplace framed in sleek, custom built-in shelving. Seamlessly flowing from the living room is the gorgeous formal dining room, which captures views of both the ocean as well as the front courtyard. The dining room is served by a walk-in wine room with an 1,800± bottle capacity. There is a stunning club room that features a professional-style wet bar, a billiard area and media center. Through sliding glass doors, the club room opens up to the west pool terrace. Opposite the doors to the west pool terrace, the club room opens up via loft-style sliding glass doors to a custom-fitted oceanfront study and oceanfront exercise studio with a full bathroom doubling as a cabana bath. Separate staff quarters contain a sitting room, kitchen, bedroom and bathroom. The showpiece kitchen is very spacious and provides an abundance of counter space and hand-crafted cabinetry. There are state-of-the-art appliances, such as a six-burner Wolf gas range with double ovens, two Sub-Zero refrigerators and freezers, Sub-Zero wine cooler, and three Bosch dishwashers. This kitchen also consists of a butler’s pantry, which itself has a Wolf oven, microwave and warming drawer as well as a Miele steamer and coffee/espresso system. This luxury kitchen also has a dinette that captures beautiful ocean views. The dinette segues into the remarkable family room, pictured above, which is also adorned with incredible ocean views and served by a full-service bar. Large glass doors lead to the poolside loggia. Ascending the spiral stairs takes one to the loft-style ocean front lounge that is open to the reception room below. The master bedroom is expansive. It is situated within its own wing and entered by double doors. Overlooking the ocean is the master suite’s open sitting room. From the sitting room, one can step out to an oceanfront balcony for outdoor relaxation. The master suite comprises two wardrobe rooms and two incredibly luxurious master bathrooms. One features a jetted tub and is finished in marble, onyx and mother-of-pearl, while the other is finished in marble and glass mosaic tile. They both feature multi-head showers and separate water closets. Loft-style sliding glass doors connect the master suite to an additional oceanfront room that can serve as a gym, office or nursery. There are four other bedroom suites, one of which faces the ocean, that can be found in the other wing. They are all accompanied by a sitting room with an oceanfront balcony. Villa Oceano Azul has its own separate guest house that is perfect for guests staying over an extended period of time, as it consists of a living room, kitchen, bedroom, full bathroom, powder room, and laundry room. Once again, this incredible luxury estate has been newly priced and is now offered at $29.95 million USD. This is an opportunity that a discerning buyer in the market for a luxury home should not overlook. For more information regarding Villa Oceano Azul at 1400 South Ocean Boulevard, Manalapan, Florida, contact Pascal Liguori at (561) 278-0100 or by email at pascal@premierestateproperties.com. This entry was posted in Newly Priced on April 11, 2016 by Pascal Liguori. This entry was posted in Newly Priced on December 3, 2015 by Pascal Liguori and Son Inc..
1875 Lake Drive | Delray Beach, Florida Newly Priced: $1.895 Million On groomed greenery-filled grounds, this custom-built architect-designed Key West-style residence is charming and inviting while generously sized for large groups of family and friends. Tropical foliage secludes the fenced outdoor entertainment area featuring an open-air kitchen and a free-form pool with sun shelf and spa. This entry was posted in Newly Priced on May 13, 2015 by Pascal Liguori.